“Barry [Blencathra Foxhounds] drew again down Lansdale Fell, found, and hunted over to Mill Beck, marking to ground in “Porter’s Parlour”. Now I would have attempted the short climb to where they were digging, but a very interesting Mr. John Gregg came and spoke to me and told me the history of “Porter’s Parlour”. It is the largest man-made borran ever known, built about 30 years ago by Ronnie Porter. A maze of pipes and entrances exists … The fox in Porter’s Parlour was accounted for, making a total of four foxes that day … and the fifth fox of the day was added to the tally” (The Gaffer, “Spring Hunting in the Cumbrian Fells”, Hounds magazine, November ’93). Used by gamekeepers and farmers? “Foxes are lazy diggers” and tend to enlarge rabbit holes or use badger setts or man-made structures such as drains, hay-bale stacks and piles of rocks (‘Methods of fox control’, National Working Terrier Federation). Artificial earths can be put in areas in order to encourage foxes to live in them, the excuse being that they are then easier to find if they are causing trouble in an area, though the NWTF state that experience has shown that those which do the most damage tend to be the easiest to locate anyway (via trails of feathers, for example). 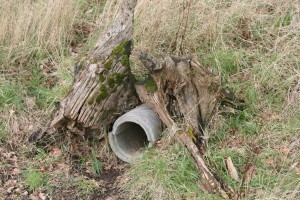 In 2002, in The Observer article mentioned above, Simon Hart of the Countryside Alliance is referenced as saying that most artificial earths date back decades and are no longer in use, that many were built in order to encourage foxes to settle somewhere away from poultry farms (implying that farmers build them for such purposes…) and not for hunting. As building artificial earths is not actually illegal, it seems unclear as to why farmers would have done this in the past but that many of the earths are no longer used. Unless farmers suddenly decided that foxes were no longer a problem to them regardless of where they settled…? Why would these earths be used for so long to encourage foxes to live elsewhere and then suddenly farmers abandon them and abandon the idea? In the same article a spokesperson from the National Farmers’ Union states that he “would be amazed if farmers were involved. If hunts are using artificial earths for foxes, that would anger farmers”, the implication being that their use encourages the fox population. Used by hunts to encourage breeding? “The earths are usually sunken concrete chambers built into the ground and connected by a network of tunnels. Foxes are encouraged to live in them and are sometimes fed and given water. They are usually built in areas near to key hunt ‘meets’, for example in woodland that will be hunted on Boxing Day or other prime occasions. The earths ensure that foxes are always available for a hunt in a specific area” wrote Paul Harris in The Observer in 2002. ‘this summer we’ve put in another artificial on a local spot that’s a bit of a magnet for foxes… it will make a real sight when a fox bolts out through it… we got it done so it’s an investment for the future, another place to check for a fox when we’re having a blank day. We’ve put a drain in each year for a good while now’. Used by hunts to provide sport? 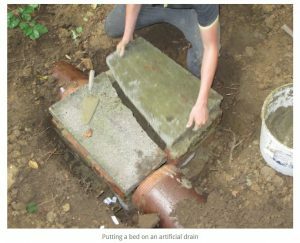 “If providing artificial earths, you know where the damn things are” states ‘severnmiles’ quite concisely on 11/10/06 on the Horse & Hound forum online. Obviously aside from encouraging breeding in order to have foxes for chasing in an area, there’s the ‘added bonus’ of knowing where to specifically go to find a fox if it is an otherwise ‘blank day’ (hounds having picked up no scents in the area). 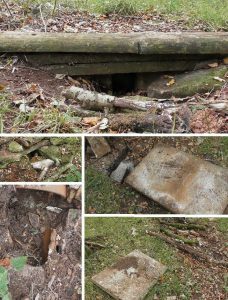 Additionally, it is far easier to bolt or dig a fox out from an artificial earth rather than a natural earth or a badger sett especially (as these are far more complex structures below ground… hence why they are so often blocked when a hunt is due to meet nearby). As “no self-respecting fox would stay above ground if he could keep below” foxes will want to find a place to shelter when being chased by a pack of hounds. In “Methods of fox control (pre-ban)” the Masters of Fox Hounds Association state that “the fox is always hunted in territory with which it is familiar. It will know where to go to give itself the best chance of escape”. A number of different materials may be used to create an artificial earth and there are a few different designs that are commonly found dotted around the countryside. Many of the artificial earths found in the three counties and, indeed, across the country, are not in a state of disrepair. Some show signs of regular maintenance, others are obviously new-builds, some have had recent repairs after recent dig-outs, most smell of fox or badger (not all are ‘badger-proof’) and many have fresh animal carcasses or other food left nearby, obviously placed there as opposed to being taken or dragged there by the foxes themselves. We know fine well that many of our hunts use artificial earths. In November 2016 during the opening meet of the hunting season for the Duke of Beaufort’s Hunt members of Three Counties Sabs and Cirencester Illegal Hunt Watch caught Beaufort terriermen and pals digging at an artificial earth situated on land owned by the hunt itself in Badminton just minutes after hounds had set off from the kennels. 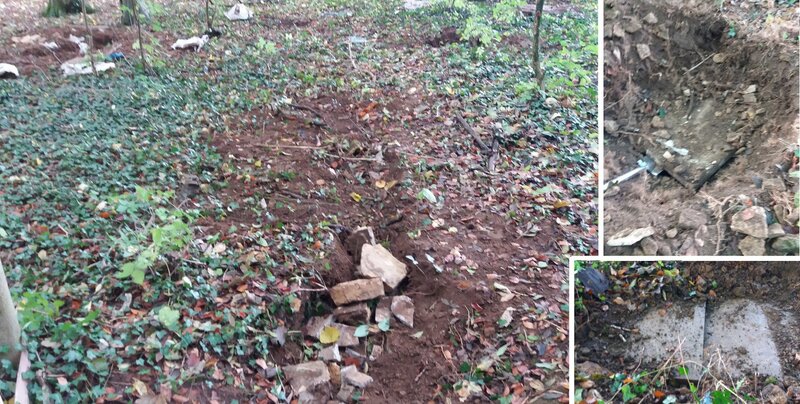 Another artificial earth had been freshly blocked up, found alongside a badger sett, also blocked, to prevent foxes being able to go to ground during the hunt. This is by no means an exhaustive list of our experiences with hunts and artificial earths, merely a snapshot of the types of activity we’ve witnessed. Similar scenes happen each week up and down the country with different hunts. 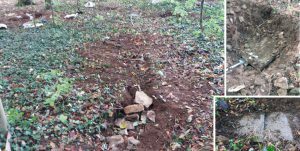 Before his death, ex-huntsman Clifford Pellow told sabs from our group that the best thing to do with any artificial earths found was to destroy them and put them out of action. Artificial earths have been filmed on a number of occasions and, while footage can be useful in showing what the hunts are still up to as well as adding an extra nail in the coffin of a hunt who are having a larger case built against them, they’re also the reason that many foxes are killed during hunt meets… so the advice is to get rid of them, whether filming them first or not. 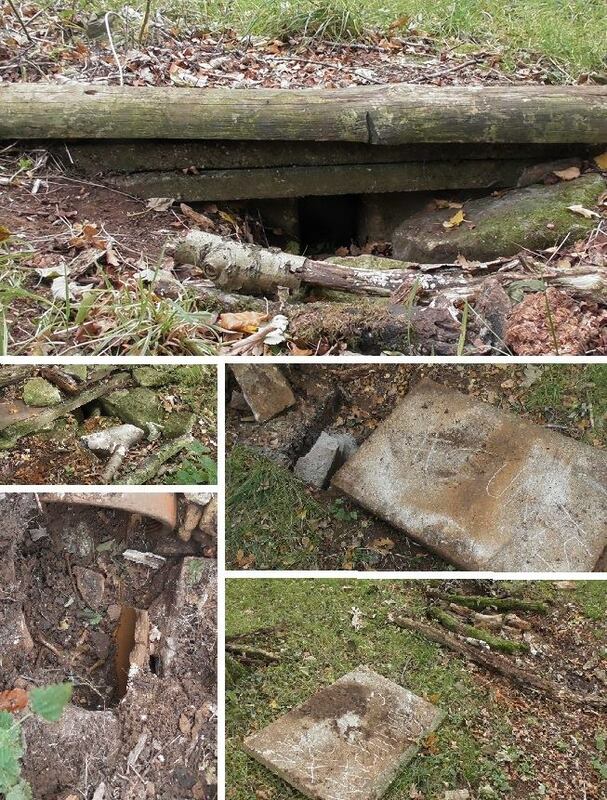 We have various investigations going on in our parts of the country so if you know the location of any artificial earths please let us know – it could be that we already have something going on with it or it could be new to us so a quick chat about it is always appreciated!